Nadine Axisa’s velvety voice, brings to life the iconic numbers immortalised by the voice of Frank Sinatra. Performing many of Sinatra’s most popular and classic hits, Nadine will take the audience on a time-hopping journey set in the time-less elegance of the Grand Ballroom at The Phoenicia Hotel in Floriana. 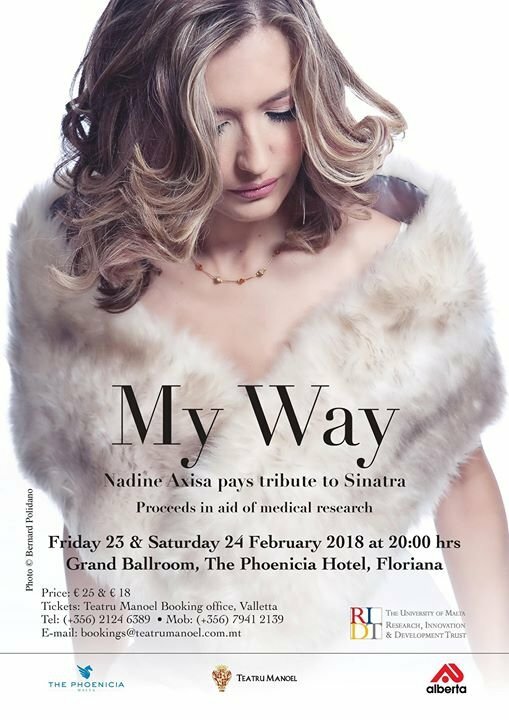 'My Way – Nadine Axisa pays tribute to Sinatra” is reminiscent of the foot-tapping, finger-snapping enthusiasm of the swing era. Nadine will be accompanied by a 4 piece live band, whose line-up features some of the best Maltese jazz musicians. This concert is organised by the RIDT, the Research Trust of the University of Malta. All proceeds will go towards medical research. The University of Malta Research Innovation and Development Trust (‘RIDT’) was established by the Government of Malta in 2011 as an integral component of Malta’s established policy to bolster investment in research and development on a national level. It’s main function is to attract funds from private and corporate bodies and organise fund raising activities to be used to maximise and exploit the research milieu at the University of Malta. Kindly note that this is a FREE SEATING event.